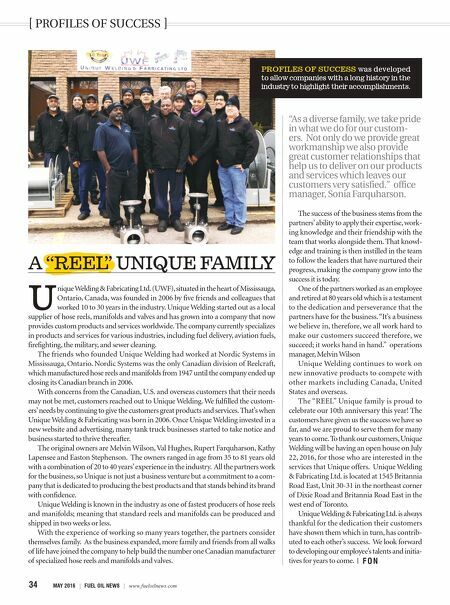 34 MAY 2016 | FUEL OIL NEWS | www.fueloilnews.com U nique Welding & Fabricating Ltd. (UWF), situated in the heart of Mississauga, Ontario, Canada, was founded in 2006 by five friends and colleagues that worked 10 to 30 years in the industry. Unique Welding started out as a local supplier of hose reels, manifolds and valves and has grown into a company that now provides custom products and services worldwide. The company currently specializes in products and services for various industries, including fuel delivery, aviation fuels, firefighting, the military, and sewer cleaning. The friends who founded Unique Welding had worked at Nordic Systems in Mississauga, Ontario. Nordic Systems was the only Canadian division of Reelcraft, which manufactured hose reels and manifolds from 1947 until the company ended up closing its Canadian branch in 2006. 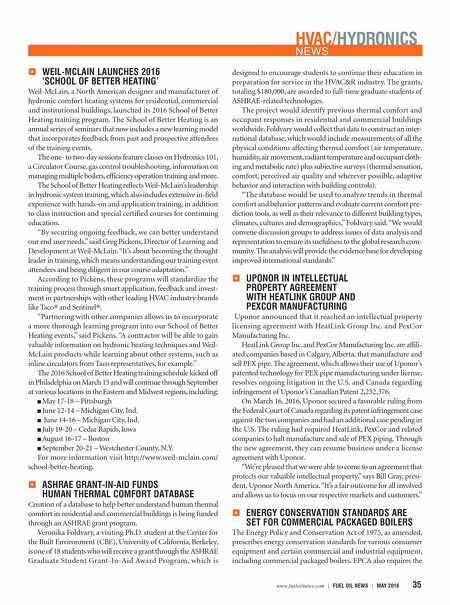 With concerns from the Canadian, U.S. and overseas customers that their needs may not be met, customers reached out to Unique Welding. We fulfilled the custom- ers' needs by continuing to give the customers great products and services. That's when Unique Welding & Fabricating was born in 2006. Once Unique Welding invested in a new website and advertising, many tank truck businesses started to take notice and business started to thrive thereafter. The original owners are Melvin Wilson, Val Hughes, Rupert Farquharson, Kathy Lapensee and Easton Stephenson. The owners ranged in age from 35 to 81 years old with a combination of 20 to 40 years' experience in the industry. All the partners work for the business, so Unique is not just a business venture but a commitment to a com- pany that is dedicated to producing the best products and that stands behind its brand with confidence. Unique Welding is known in the industry as one of fastest producers of hose reels and manifolds; meaning that standard reels and manifolds can be produced and shipped in two weeks or less. With the experience of working so many years together, the partners consider themselves family. As the business expanded, more family and friends from all walks of life have joined the company to help build the number one Canadian manufacturer of specialized hose reels and manifolds and valves. [ PROFILES OF SUCCESS ] "As a diverse family, we take pride in what we do for our custom- ers. Not only do we provide great workmanship we also provide great customer relationships that help us to deliver on our products and services which leaves our customers very satisfied." office manager, Sonia Farquharson. The success of the business stems from the partners' ability to apply their expertise, work- ing knowledge and their friendship with the team that works alongside them. That knowl- edge and training is then instilled in the team to follow the leaders that have nurtured their progress, making the company grow into the success it is today. One of the partners worked as an employee and retired at 80 years old which is a testament to the dedication and perseverance that the partners have for the business. "It's a business we believe in, therefore, we all work hard to make our customers succeed therefore, we succeed; it works hand in hand." operations manager, Melvin Wilson Unique Welding continues to work on new innovative products to compete with other markets including Canada, United States and overseas. The "REEL" Unique family is proud to celebrate our 10th anniversary this year! The customers have given us the success we have so far, and we are proud to serve them for many years to come. To thank our customers, Unique Welding will be having an open house on July 22, 2016, for those who are interested in the services that Unique offers. Unique Welding & Fabricating Ltd. is located at 1545 Britannia Road East, Unit 30-31 in the northeast corner of Dixie Road and Britannia Road East in the west end of Toronto. Unique Welding & Fabricating Ltd. is always thankful for the dedication their customers have shown them which in turn, has contrib- uted to each other's success. We look forward to developing our employee's talents and initia- tives for years to come. l F O N A "REEL" UNIQUE FAMILY PROFILES OF SUCCESS was developed to allow companies with a long history in the industry to highlight their accomplishments.